Graphics programs aren’t simply for just editing your photos—they can have whatever fun application you can think of. 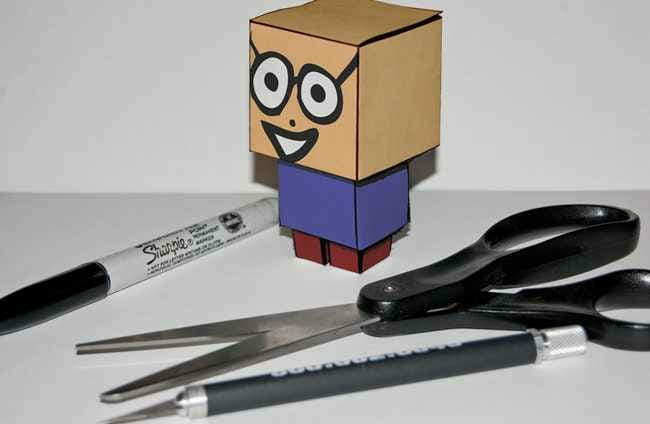 For a fun, geeky project, here’s a simple papercraft toy you can make with a printer and simple household tools. The template is a simple, tiny download containing one PNG file and one Photoshop file. If you don’t have Photoshop, you can still do this project, you’ll just be painting or drawing your printed papercraft toy by hand. Note: you could open the PNG file in another image editor and do some edits that way if you have to, it’s just a lot easier if you have Photoshop. 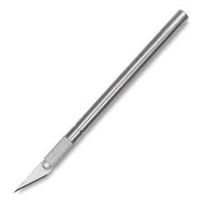 In order to thoroughly cut out your papercraft toy, you’ll need a set of scissors and some sort of sharp hobby knife, like an x-acto. 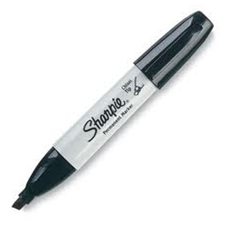 Sharpie or black magic markers are also excellent to have around either for drawing or cleaning up rough edges on your final pieces. You’ll also need a printer and some heavy cardstock, preferably around 100 or 110 pound. Photoshop is also a handy tool to have, although you can print the PNG from any program and create hand drawn papercraft toys yourself. 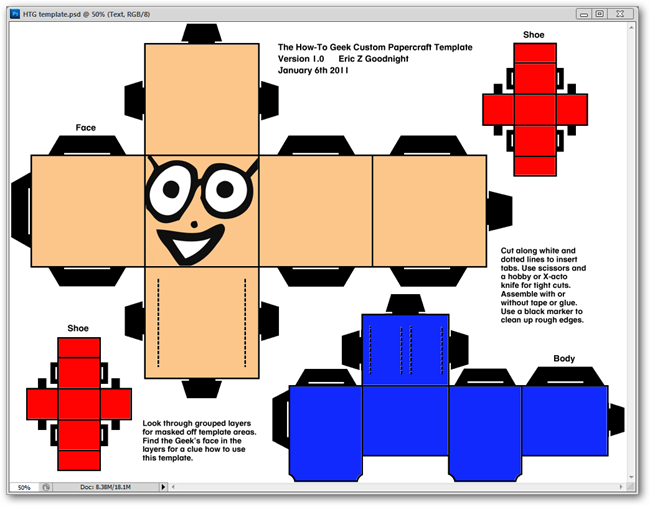 The template download will allow you to create your own custom characters with a generic square robot shape. 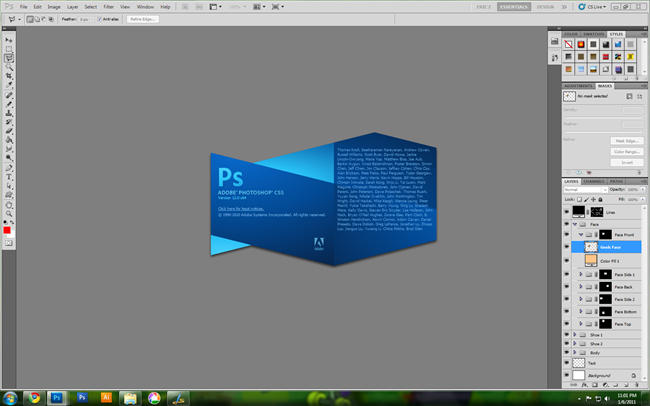 Open the file in Photoshop and look through the layers and groups. They are already masked, named, and separated for you to use. If you don’t have Photoshop (or don’t want to use it), you can use the PNG graphic to bring blank toys you can draw on yourself. Simply print it using your favorite freeware program, and skip this step entirely. For instance, if you find the layer “Geek Face,” you’ll understand better how to customize your own. 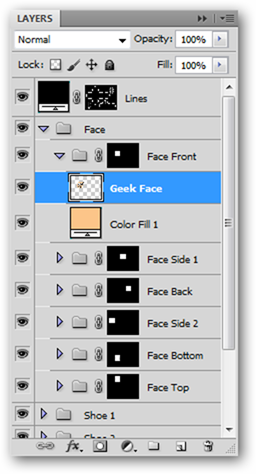 Drag any photograph, drawing, or graphic as a layer over the “Geek Face” to use your own custom graphic. You can pop any graphic you want into any of the colored squares. If you place it right, it will automatically mask it to the square, no matter how big it is. You can create whatever kind of character you want, using any graphics you wish to. Take them right off Google Images, Flickr, Deviant Art, or draw them yourself. 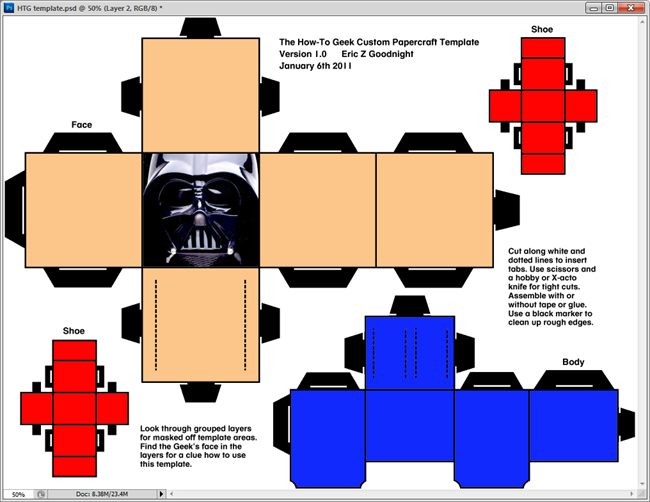 When you have customized your papercraft toy to your liking, simply print to your cardstock and get ready to cut it out. 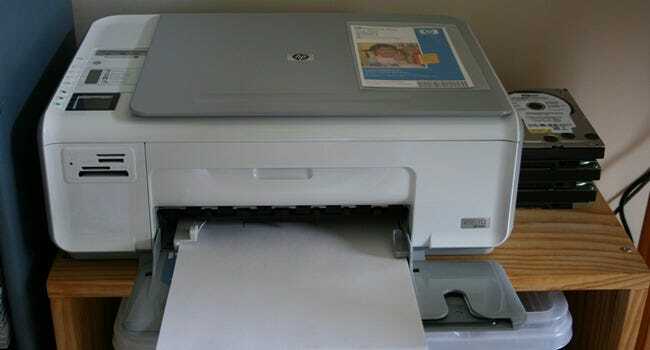 Any inkjet (or other) printer that can fit on cardstock will work perfectly. 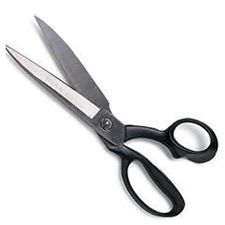 It can be difficult to cut, but simply cut out the shapes, then score the white and dotted lines with your knife. 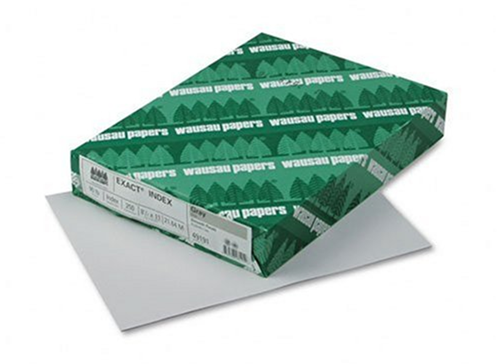 You can use regular paper, although cardstock is superior for building sturdy toys. The thinner the paper, the flimsier the toy. Fold along the solid lines to create cubes or rectangular prisms. You should end up with four pieces once you fit your tabs into the cut slots. What the body has tabs that fit into the head, and the two feet fit into the body. The construction is fairly simple, but can be frustrating. Have fun with it, and happy papercrafting! 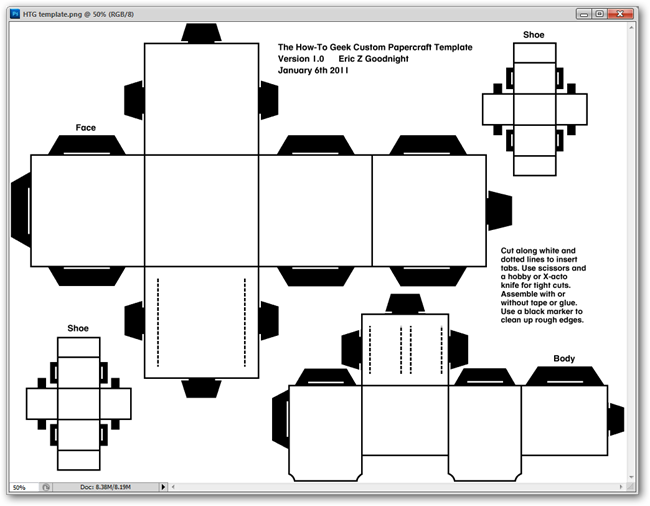 Looking forward to some fun creating your own custom papercraft toys with this template? Send photos of your favorites to the author via twitter or twitpic at twitter.com/mrbadexample. Image Credits: Product screenshots assumed fair use. Photo Printer by William Hook, available under Creative Commons. Photo by the author available under Creative Commons. The HTG Custom Papercraft Template available under Creative Commons, with inspiration from the very excellent Cubeecraft.com.